The optical properties of single colloidal semiconductor nanoparticles (NPs) are considerably influenced by their direct environment. In this thesis the influences of different liquid and solid glycol matrices on cadmium-selenide based NPs were investigated. The fluorescence characteristics of individual NPs vary considerably between different NPs. It is therefore highly desirable to use the very same, single NPs when studying the effects of different surroundings. Technically, this was realized by immobilizing spherical CdSe core/shell nanocrystals (NCs) and elongated CdSe/CdS DotRods (DRs) in a liquid cell sample holder or in self-built microfluidic devices. An optical setup was built up to investigate the samples by space-resolved wide-field fluorescence microscopy as well as energy- and time-resolved confocal scanning fluorescence microscopy. Fluorescence intensities, emission energies, blinking behavior and fluorescence decay dynamics of individual NPs were studied. In the measurements, the NPs were exposed to air, to liquid oligoethylene glycols of different chain lengths (1≤ n≤7), to liquid 2-methylpentane-2,3-diol (MPD), or to solid polyethylene oxide (PEO). 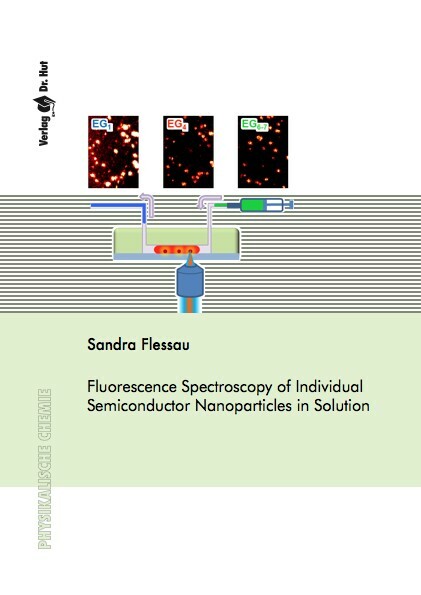 In general, the fluorescence of nanoparticles in liquid environments showed different dynamics than in gaseous or solid ones. Models based on macroscopic optical properties of the surrounding medium could not be used to describe the, in this case, large influences of direct physical and chemical interactions with the solvent molecules. Since temporal fluctuations in fluorescence properties as well as variations between individual NPs are large, many single NPs need to be analyzed to identify small environment-induced effects. It was found that PEG 300 lead to intense and stable fluorescence emission of the NPs, and is therefore very well suited as a liquid matrix and solvent for experiments that correlate chemical and physical modifications of the surface and of the immediate environment of individual NPs to their fluorescence properties.